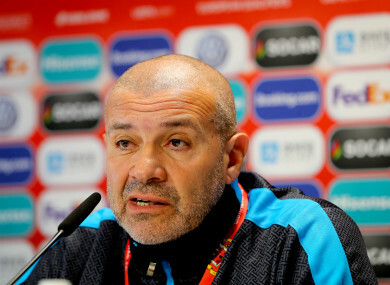 Gibraltar Head Coach, Julio César Ribas. TALK OF GIBRALTAR’S Astro pitch has cut ice in the build-up to tomorrow evening’s Euro 2020 qualifier, but Gibraltar head coach Julio César Ribas does not believe the artificial surface will help redress the imbalance between the two sides. McCarthy has not complained about the pitch, merely stating that it may complicate recovery time for some players ahead of Tuesday’s home game with Georgia. The game will take place at Gibraltar’s 2,300-capacity Victoria Stadium after much speculation that it would be moved to Faro in Portugal, given the ground didn’t initially meet Uefa standards. The Gibraltar FA agreed to improvements, however, which included adding floodlighting and improving media facilities, and the game goes ahead in the shadow of the Rock. They also carried out a few upgrades on the pitch, which meant the Gibraltar squad were unable to train on the surface until yesterday. Ireland trained on an Astro pitch at Abbottstown this week in order to best prepare themselves for the unfamiliarity underfoot. Gibraltar played their home games in the Nations League at their tiny venue, and it was the scene of their second win in the competition: a 2-1 victory over Lichtenstein. That this game is going ahead at home is a major motivation for Ribas. It’s absolutely amazing for us to play at home once again. This is where we live, this is where we play, this is where most of our players have grown up. This is the air we breathe and this is where we want to play our football. “It is amazing to play at home in front of our home fans, and we want to please them as much as we can. Ribas is Uruguayan and brought to his press conference a characteristic passion, at one point turning to the player beside him – Tjay De Barr, a teenage striker who has recently signed for Real Oviedo in Spain – to ask him who he has in mind when he walks out onto the pitch. “Every single Gibraltarian”, came the dutiful reply. De Barr, meanwhile, is excited about the atmosphere likely to be generated by the travelling Irish support. “They are coming to make noise, 100%. Email “'It's not a leveller in any way' - Gibraltar boss dismisses Irish concerns over artificial pitch”. Feedback on “'It's not a leveller in any way' - Gibraltar boss dismisses Irish concerns over artificial pitch”.